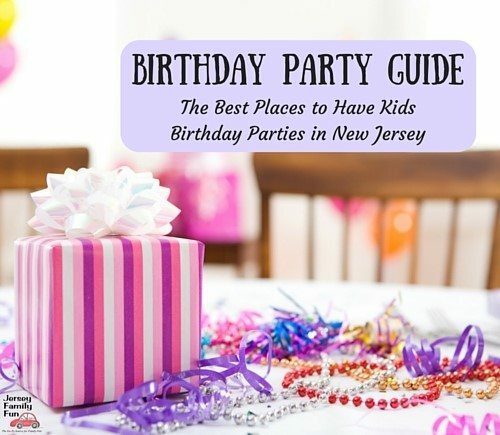 The Land of Make Believe in Hope, New Jersey is a smaller family run amusement park that boasts both water fun and rides. Located in Warren County, it is an easy ride to the park from Route 80 West. I’ve taken my twins there twice over the last two years and I haven’t been disappointed. 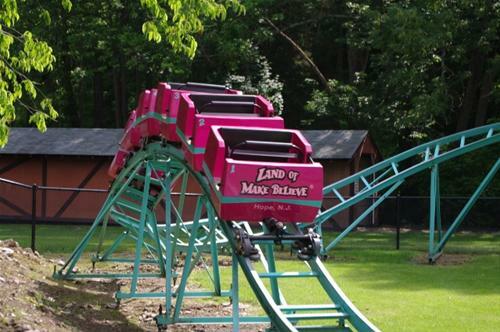 The Land of Make Believe is located at 345 Great Meadows Road in Hope, New Jersey. They are open from 10 am to 6 pm. The park is designed for little kids as the water is knee deep. 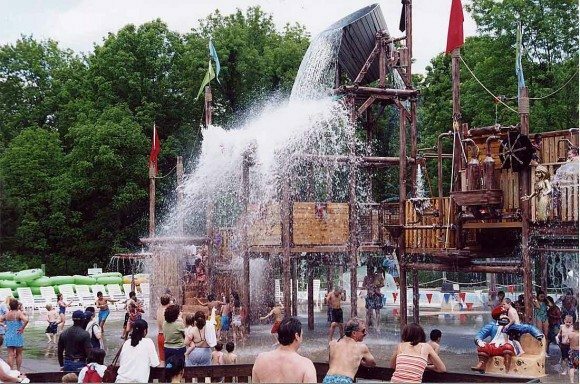 Their wading pool has a pirate ship with real water cannons and slides. There are loads of little slides in a pool with a soft rubber bottom. For the older siblings there are a few pretty scary water slides. The lazy river is fun for the whole family. They also have convenient lockers and changing cabanas that make it easy to change. Only criticism: They don’t allow life vests of any kind, nor do they offer them to their patrons. The lazy river is over 3 feet deep and can make it difficult for parents who have multiple children on the ride. This park’s “dry” section has more little kid rides than big kid rides. The lines for the rides are usually pretty short and they all appear in great condition. This is also one of the few places that truly has a kiddie roller coaster. My sons usually can’t wait to hop on it as they are not allowed on any others! There is a nice petting zoo with some farm animals (sheep, goats) that is next to the dry rides. A candy cane forest? You bet! And of course this is near a large barn where you can get a slice of pizza just after going up a chimney to meet Santa Claus. There is also a talking scarecrow manned by a live person who speaks to you. There are a few carnival like stands that allow you to win some prizes. Funnel cakes and cotton candy are within arms reach as well. Going through the Candy Shop is the only way out of the park. This is one of the few amusement parks that allows you to bring in coolers or food. If you want to save a few bucks this is a great way to do that! Bring a cooler and some food and keep the costs down. An adult ticket is $23.00 and a child is $25.00. Most Kidstuff books also have coupons for purchase one kid ticket and get an adult ticket free. The only word of caution is that this park will not refund your admission if they lose power so choose a nice, clear day to go. In full disclosure this is not a sponsored post. We paid our own way and all opinions are our own. I am so excited, and can hardly wait! Our grandson is almost 8 mos. old. I enjoyed The Land of Make Believe so much as a child. We lived in West Orange, NJ and would take a ride into the country. For a very special day at the Land of Make Believe. Sometimes my grandparents would come from Wilkes Barre Pa and meet us there. It was so special!. The train, Cinderella’s Coach, The Hayride, But, the north pole is priceless. I still remember it with wonderment and awe. I thank you for the beautiful and happy memories, that you have given me, my daughters, and your commitment and years of wonder to children of all ages. We are already planning a trip with our new little one.